No one understands the octopus. With eight arms, three hearts, camouflaging skin, and a disarmingly sentient look behind its highly evolved eyes, how could it appear anything but utterly alien? Octopuses have been captivating humans for as long as we have been catching them. Many cultures have octopus-centric creation myths, art, and, of course, cuisine. For all of our ancient fascination and millions of dollars' worth of modern research, however, we still have not been able to get a firm grasp on these enigmatic creatures. The oldest known fossilized octopus is estimated to have lived 296 million years ago--even before the first dinosaurs emerged.Government agencies are funding research labs around the world to re-create the octopus's naturally occurring camouflage techniques.About two thirds of an octopus's brain capacity is spread throughout its eight arms, meaning each one literally has a mind of its own.Octopuses have aced numerous intelligence tests, including opening childproof bottles, solving mazes, and even recognizing individual people.The octopus can change colors and textures within milliseconds to vanish against its background--yet we have no evidence that it can see in color. Courage deftly interweaves personal narrative with interviews with leading octopus experts. 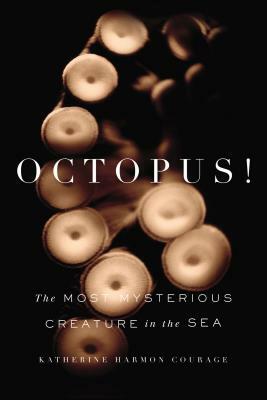 The result is an entertaining yet scientifically grounded exploration of the octopus and its infinitely complex world. Katherine Harmon Courage is an award-winning freelance writer and contributing editor for "Scientific American." Her work covers health, biology, food, the environment and general interest stories and has appeared in books, magazines, newspapers and web sites, including "Gourmet, Nature" and "Scientific American." Read more on her website, www.katherineharmon.com and follow her on Twitter at www.twitter.com/katherineharmon. "Katherine Harmon Courage’s first book Octopus! is crammed with funny, weird, memorable stories about human interactions with cephalopods that start out strange and only get stranger." "I love Octopus! What creature is more beguiling, expressive and enigmatic? Katherine Harmon Courage's breezy, accessible book introduces us to a top predator, a shape-shifter, a sea mystery that no one can resist."